This was a successful season of rugby for the Fourth Form. There was a noticeable improvement in the skills required and none more so than in the contact situation where the commitment of the year group and the courage of most meant they were rarely bettered in the ruck where they secured their own ball and were excellent at turning over opposition’s possession. The B, C and D teams were particularly blessed with forward power and this served them well throughout the wetter months enabling them to grind the opposition down before unleashing the backs. This was best illustrated in the B team’s outstanding victory against Donhead in the Dunkley Shield. The strength in depth was such that only one game was lost between these three teams out of 24 matches! The A team results were not quite as startling. They won as many as they lost but were more successful when playing in festival conditions. 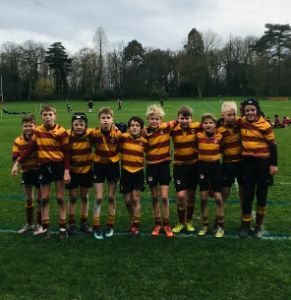 This was particularly evident towards the end of the season as they produced their best displays in close fought contests at both the Donhead Festival and the Surrey Festival.